Running Windows 10, the Microsoft Lumia 650 Smartphone is the second Microsoft Windows phone we have written an article about. A nice 5″ display and an aluminum frame make this a good sized fairly rugged device at a competitive price. I have no position on Windows 10. I’m a hardware guy. So let’s get down to the specs. The Microsoft Lumia sports a 5-inch OLED display at 1,280 x 720 resolution. The phone without a case measures 5.5 x 2.8 x 0.27 inches and weighs in at 4.3 ounces. There is an 8MP rear camera and 5MP front facing. The rear camera is placed somewhat near the upper middle of the back of the phone so if you plan to use the camera while mounted, that rules out any mounts with cradles that will block that part. Remember, that if you have plans to add a case, which is something I always recommend, be sure to measure it because the specs provided are for the bare phone. These are the measurements and specifications needed when selecting a mount. A universal mount is needed for these phones as I’m not aware of any custom mounts on the market for this brand (let alone this model). Most universal mounts should fit as the Lumia 650 is not overly large. For those that have purchased a universal mount to hold your older phone, hopefully it opens wide enough to hold your new device without a problem. If not, many universal mounts offer options to upgrade your cradle to a larger one. On to the mount discussion for the Microsoft Lumia 650. For the car, give the location of your mount some thought. There are lots of places to mount your Microsoft Lumia 650. The windshield is the most popular location to mount especially if you plan to use it as a GPS with my favorite application which is Waze. We are big fans and speak to personal positive experience with the Arkon’s Megagrip Travel Mount for mounting a phone on the windshield. This mount has the necessary expandable cradle which expands to 3.4 inches by pressing the button at the lower left corner. This will fit your phone with or without a case. The mount comes with an adhesive dash plate so that you can attach to the mount to your dash as well as your windshield. This dash disk is handy for states that do not permit windshield mounts which we documented in a recent article. Got an extra cup holder? 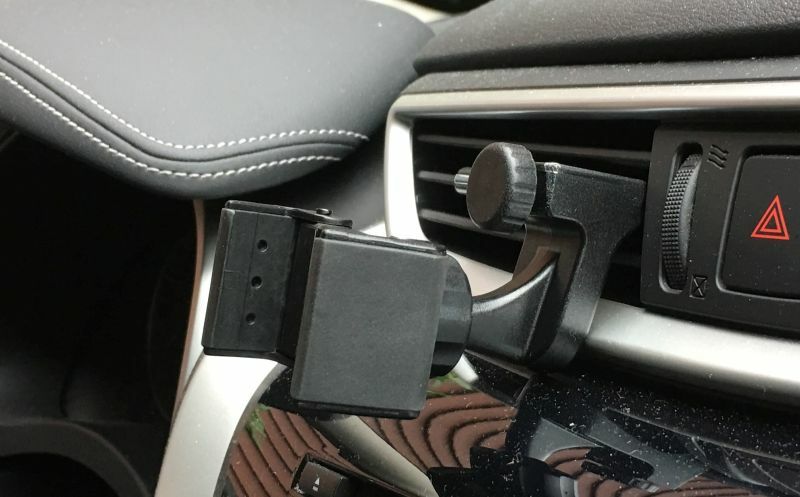 Consider the iKross Car Cup Holder Phone Mount. The cup holder base is expandable from 2.7 to 3.7 inches. It will fit almost any vehicle’s cup holder. There is a 12″ flexible stem that allows bending of the mount to the right angle for the driver or passenger. The phone can rotate 360 degrees into portrait or landscape and is easy to insert and remove. The expandable cradle opens to 8 inches so it will fit your phone with or without a case or skin. Another of our other favorite spots for mounting a Microsoft Lumia 650 is the air vent. Consider the Square Jellyfish Jelly-Grip Car Air Vent Mount. It’s the one featured in the photo that accompanies this article. The Square Jellyfish Jelly-Grip mount can be used to hold most phone models with or without a case or skin. It has a ball and socket so the cradle so can be tilted and pivoted. You can turn the phone into landscape or portrait. This mount will work on flat vent slats that are 3/8 to 1 inch deep. The included cradle opens to 3 5/8 inches so it’s large enough to hold either model. We reviewed the Square Jellyfish mount in detail on our site. For motorcycle use, it’s important that you select a mount that has a well constructed cradle that is going to hold your Microsoft Lumia 650 very tightly so that it stays put through the vibration of a ride. We continue to recommend the RAM X-Grip line. These are heavy-duty mounts that are mostly constructed of metal and feature a lifetime warranty. The mount has gone through some rigorous shake tests and holds up well on a motorcycle. We wrote about X-Grips extensively on this site and you can view that article here. Most motorcycles can use the RAM X-Grip IV Handlebar Mount. These mounts feature the expandable X-Grip IV cradle which can open to 4.5 inches which is large enough for most cases. We always recommend tethering your device for added security and RAM now includes a tether with these mounts which is a thoughtful touch.